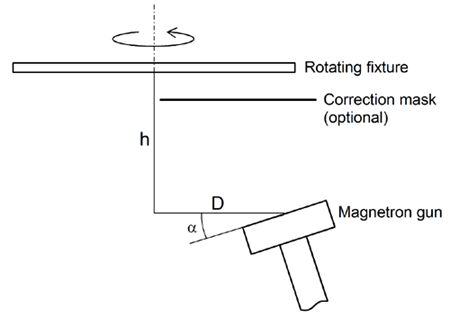 One of the most common arrangements for magnetron sputtering is illustrated in the schematic drawing below: substrates are mounted on a rotating fixture; the sputtering target, with a ring-shaped erosion pattern, is positioned a distance h from the fixture and a distance D off the rotation axis of the fixture. alpha, are not always easy to determine. 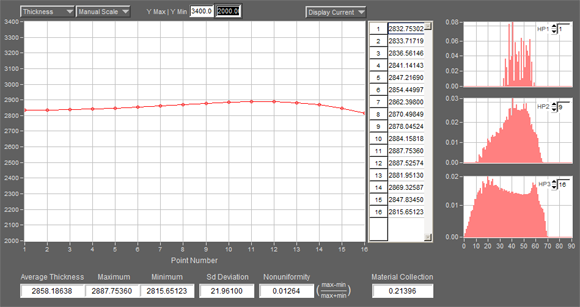 With V-Grade 5S, one can explore all the possibilities in virtual experiments and easily discover the positioning parameters that best suit your requirement. V-Grade 5S also tells you the absolute thickness: for each gram of silicon removed from the target you get a coating of 2858 nanometer on average thickness. The screenshot below shows the thickness distribution. The three graphs on the right are histograms of vapor incident angle at three different radial positions.